Several elite ProTour riders, who have gained fame and fortune at prestigious European cycling events, like the Tour de France, are confirmed to compete Labor Day weekend in the Greenville Hospital System USA Cycling Professional Championships. Race organizers confirmed today that George Hincapie (Discovery Channel Professional Cycling Team), Bobby Julich (Team CSC), Levi Leipheimer (Discovery Channel), and David Zabriskie (Team CSC) are among the athletes who will compete in one or more of the dual championship events September 1-2. "We are very pleased to see George, Dave and Levi return along with many of the top Pro Tour riders who don't often compete in the United States. This will be a great, quality field for both the time trial and road race," said Sean Petty, Chief Operating Officer for USA Cycling, Inc. "For some of the riders, this will be an excellent tune up for the World Championships later in the month. Dave Zabriskie's outstanding performance last year in the time trial at The Cliffs was a great prelude to his medal winning performance at the Worlds." Other top names in domestic cycling who will compete in Greenville are: Best Young Rider in the 2003 Tour de Georgia Saul Raisin (Credit Agricole), National Racing Calendar* men's individual points leader Ben Jacques-Maynes (Priority Health presented by Bissell), former Road Race National Champion Chris Wherry (Toyota-United Pro), 2006 USPRO Time Trial runner-up Chris Baldwin (Toyota-United Pro), third place finisher in the 2006 USA Cycling Professional Road Race championship Danny Pate (Team Slipstream), and 2004 Olympic Games Time Trial gold medalist Tyler Hamilton (Tinkoff Credit Systems). "The prestige of the USA Cycling Professional Championships for road racing has a long tradition in America. The move from Philadelphia to Greenville last year was a huge success, for both the athletes and the spectators. We anticipate record crowds in the Greenville this year throughout the holiday weekend as there is so much to see and do - three days of festivities, two great championship events and spectacular natural beauty of the Upstate," said Chris Aronhalt, Managing Director of Medalist Sports and Executive Director for the Greenville Hospital System USA Cycling Professional Championships. The first race in the Greenville Hospital System USA Cycling Professional Championships will be held on Saturday, September 1, the USA Cycling Professional Individual Time Trial Championship, presented by The Cliffs. This 18.7-mile race against the clock will be contested from The Cliffs at Mountain Park to The Cliffs Valley, approximately 30 minutes north of Greenville. Last year was the inaugural time trial championship for U.S. professionals and it was won by Zabriskie of Salt Lake City. The USA Cycling Professional Road Race Championship will take place on Sunday, September 2, beginning at 1:00 p.m. in downtown Greenville. Over 100 competitors will battle on a 110-mile course, won last year by Greenville resident Hincapie. The USA Cycling Professional Road Race Championship, a one-day road race which began in 1985, was previously held in Philadelphia, Pa. Past winners of the prestigious Stars and Stripes jersey for the road race discipline, which signifies the American champion, include speed skating Olympic champion Eric Heiden (1985), Lance Armstrong (1993), Hincapie (1998) and Fred Rodriguez (2000, 2001, 2004). The final fields for both the Individual Time Trial and the Road Race will be confirmed the final week of August. Professionals will compete for over $60,000 in prize money, and the rights to wear the prestigious Stars and Stripes jersey for one year. The events are sanctioned by USA Cycling, the governing body for the sport of cycling in the United States, and managed by Medalist Sports. If race fans cannot be in Greenville to watch the competition in person, race weekend events will now be broadcast via live video. The webcast will begin at the opening press conference and at a preview reception on Friday, August 31. There will also be post-race interviews for the Individual Time Trial on Saturday, September 1 and Road Race on Sunday, September 2. The live video will be broadcast on the event website - www.usacyclingchampionships.com/index.php. Leipheimer, a Santa Rosa, California resident who has raced professionally since 1997, is considered an all-around rider who can contend for both the road race and ITT titles. Racing with the Discovery Channel Pro Cycling Team, he finished third in this year's Tour de France and also captured his first Tour de France stage victory, winning the final time trial of the three-week event. This year he has also won the overall title at the Amgen Tour of California and two stages in the Tour de Georgia. Leipheimer finished second in last year's USA Cycling Professional Road Race Championship. He is currently fifth in the Tour of Germany (which ends August 18). "I was truly impressed with both the course and the crowds in Greenville last year and am looking forward to coming back again. The course suited me very well," said the 33-year-old Leipheimer. Last year Hincapie outsprinted Leipheimer in the final mile for his second Stars and Stripes jersey (he also won the U.S. title in 1998). A resident of Greenville, the 33-year-old Hincapie has completed 11 Tour de France races and is a four-time Olympian for the United States. "It's my hometown, so motivation is certainly not a factor for me. It was great to have the entire U.S. Cycling scene in my backyard. I am looking forward to racing in front of my family and friends again and I can only hope that I could repeat my performance from 2006," Hincapie said. He is also racing in the weeklong Tour of Germany with Leipheimer. Zabriskie, one of three American members of Team CSC, is known as a time trial specialist. His biggest win was in 2005 at the Tour de France when he won the opening Prologue and wore the yellow leader's jersey. He became the first American to win a stage in all three grand tours: Vuelta a Espana, Giro d'Italia, and the Tour de France. This year, the 28-year-old Salt Lake City, Utah native has already won two time trials, at the prominent Dauphiné Libéré event in France. "The course is very challenging because of the technical aspects of it so I have to take it very serious in order to do well. I will be back to defend (the title)," Zabriskie said. Julich started his professional career in 1992 and has raced in the Tour de France nine times, starting in 1997. In the 1998 Tour de France, he finished third overall. He also won the bronze medal at the 2004 Olympic Games in the Time Trial discipline. In late July of this year Julich finished second in the five-day Sachsen-Tour International in Germany. He helped Team CSC win the Team Time Trial this week at the Tour of Germany. Raisin, a native of Dalton, Ga., will return to professional cycling after a 16-month absence due to severe head injuries sustained from a crash in the Circuit de la Sarthe in France. He began his pro career in 2005 with Credit Agricole and finished 13th in the Tour of Austria and won the GE Best Young Rider award jersey at the 2003 Tour de Georgia. In 2006 Raisin won a climbing stage of the Tour de Langkawi in Malaysia. "It means more than words can describe," the 24-year-old Raisin said about his comeback. "My official return will be when I pin on my number and line up with everyone else. It will make me feel great. "I have been training hard for US Pros and can't believe that it will happen in a little over two weeks. I will also be visiting my family in Georgia right before the race," Raisin said on his website. Former Phonak and U.S. Postal Service rider Tyler Hamilton rejoined competitive cycling this spring at the Tour de Georgia after serving a two-year suspension. He has won stages in all three of the Grand Tours and a gold medal in the time trial discipline at the 2004 Olympic Games. Colorado Springs native Danny Pate finished third last year in the USA Cycling Professional Road Race Championship. A member of Team Slipstream presented by Chipotle, the seven-year pro is a veteran who can compete in any discipline. One of his career highlights was winning the 2001 U23 Time Trial World Championship. Ben Jacques-Maynes is a 28-year-old California speedster who races for Priority Health presented by Bissell. After winning the U-23 Cyclocross National Championship in 2000, he turned his attention to road cycling. He has already won five individual stages in races this year, and won the overall at the Central Valley Classic. His 32 Top 10 finishes puts him No. 2 overall (as of Aug 10) in the USA Cycling National Racing Calendar standings. Toyota-United Pro Cycling Team's Chris Baldwin finished second to Zabriskie at last year's USA Cycling Professional Individual Time Trial presented by the Cliffs. The 31-year-old, who lives and trains in Colorado, was only one of two Americans selected to compete in the World Time Trial Championships last year. Baldwin has a total of 19 career wins, including two national time trial championships (2003 and 1005). He is currently third overall this year on the National Racing Calendar* men's individual standings. 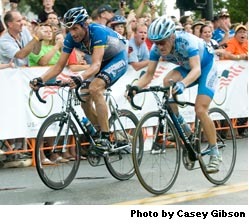 Chris Wherry, another Toyota-United rider to watch, won the USA Cycling National Road Race Championship in 2005, the last year the event was held in Philadelphia. The 10-year veteran from Colorado seven total first place finishes last year, including winning Stage 1 and the overall at the Cascade Cycling Classic. This year he continues as a team leader with Toyota-United Professional Cycling team six Top Five finishes, including 4th overall at the International Tour de Toona. *USA Cycling's National Racing Calendar men's individual standings are current through August 15, 2007.